Trusted Reviews a monochrome laser printer from Lexmark. 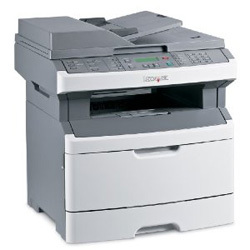 The mono printer is called Lexmark X264DN and has nice features such full fax capabilities and duplex printing. Trusted Reviews ends up giving the X264DN an overall score of 8 out of 10 possible points. The laser printer scores highest on value for your money, and a bit lower on print speeds, print quality and features. On the positive side the reviewer likes that Lexmark printer is able to scan to email and the first page out is fast. On the negative side there are issues with greyscale copy quality, no duplex scanning and no quick dial for faxing. If you look at the price tag you get a lot for your money with this monochrome laser printer from Lexmark. Read the full review of the Lexmark X264DN mono multifunction laser printer here.